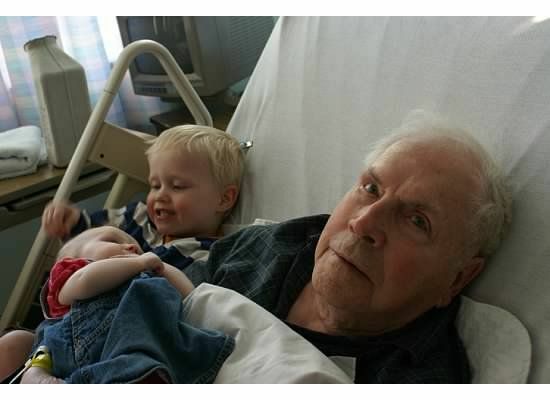 Sadly, my grandfather died last weekend at the very impressive age of 97 (and a half). He will be remembered and missed for the love, strength and support that he gave his family and friends, for the many great contributions to the Canadian mining industry during his long life, and also for his selfless service in the Royal Canadian Navy during World War II. at his 96th birthday party. 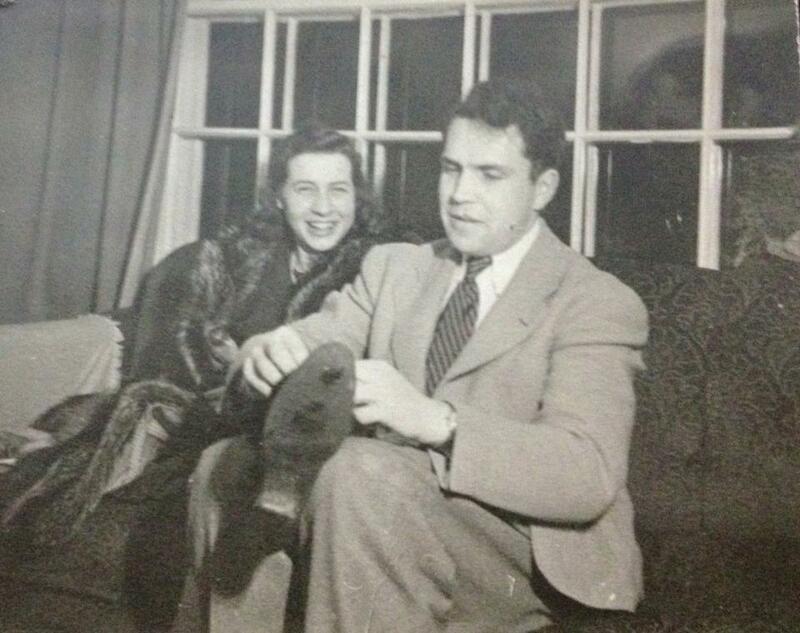 He had many great loves, including, in no particular order, his beloved wife Jean, golfing, fishing, mining, family, Scotch whiskey, and Queen and country. 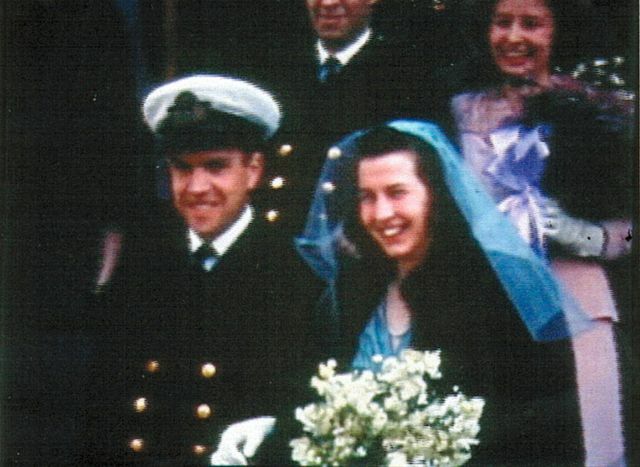 Although my Nana died when I was in middle school, I still remember the deep love and devotion that she and Papa had for each other that shone through whenever they were together. When wintering in Florida, he and Nana rarely missed a day of golf, and he took it upon himself to try to teach each of his grandkids a few tricks of the trade. 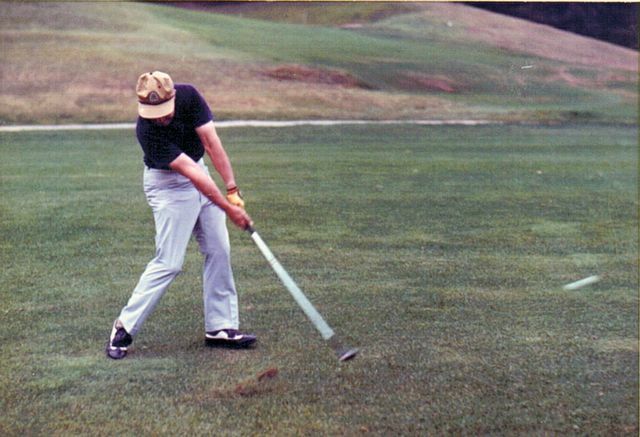 I remember clearly the day he called (I was around 14) and said, “Karyn, I need you to come over.” He sat me down in his den to watch a video – something like Arnold Palmer’s Guide to the Perfect Swing – and then returned and asked, “So, did you get all that?” (“NO!?”). Then he took me to the backyard, strapped me into a straitjacket-like device that pinned my upper arms to my sides to help me maintain perfect form, and attempted to perfect my golf swing. (It didn’t work.) After a few hours of that, he took me to a mini-golf course (“AHA!” I thought. “Back in my comfort zone!”) where he proceeded thoroughly trounce me. Papa golfing (probably in Florida). 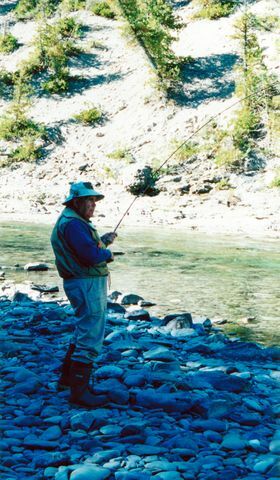 As a salmon fisherman, he was also untouchable, and enjoyed many trips to salmon rivers around North America. Papa on the riverbank fishing – if memory serves, this means that he has hooked a salmon while in the canoe and is now working on reeling it in, which is done from the bank. 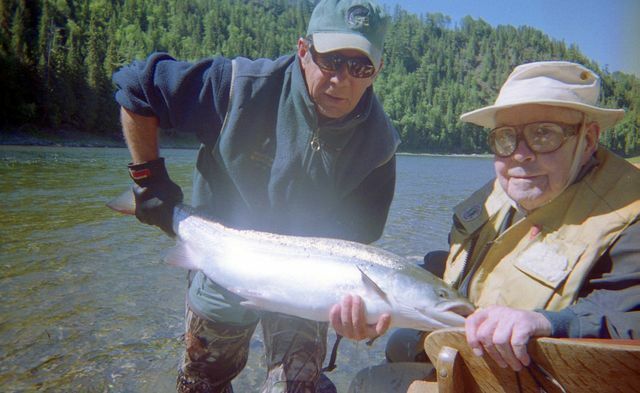 At 95 he went on his last fishing trip and caught a huge salmon – checking their carefully-kept records (dating back generations), the fishing lodge was able to confirm that he was in fact the oldest person to have caught a salmon of that size. Papa with his big fish – he swears, it was THIS BIG, and he has photographic proof! Papa devoted the majority of his working life to mining, and was a giant of the Canadian mining industry. 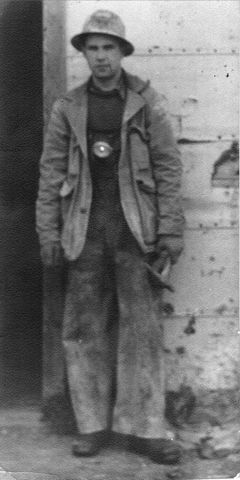 Papa in an underground mine as a young man. Papa, back underground, in later years. A hands-on approach to problem-solving, forged in both war and peace, enabled William Guy Brissenden to master repeated challenges during a lengthy career spent mostly with Noranda. His extraordinary skills surfaced as a member of the management team that successfully developed Gaspé Copper’s mine, mill and smelter at Murdochville, Quebec. He led Noranda’s team when it acquired control of Brunswick Mining and Smelting, and helped it become the major zinc-lead producer in eastern Canada. A champion of safety and technical innovation, Brissenden is particularly noted for initiating the trackless room-and-pillar mining method, as well as the mechanized cut-and-fill system. On the metallurgical front, he convinced Noranda’s Board to invest in new technology that extended the life of the Horne smelter in Quebec. 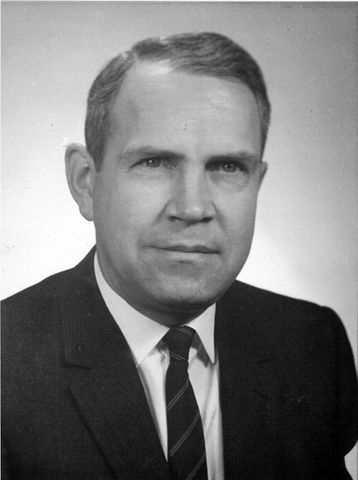 Born in Halifax, Nova Scotia, Brissenden obtained a B.Sc. 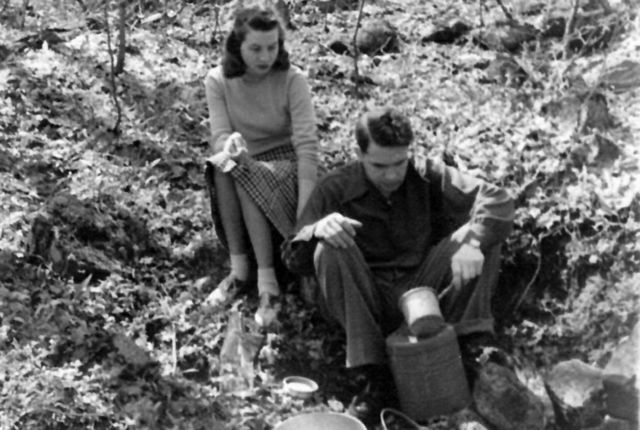 degree in mining engineering from McGill University in 1937, followed by an M.Sc. in 1938. As a naval officer during the Second World War, he solved secret technical problems that helped win the Battle of the Atlantic. 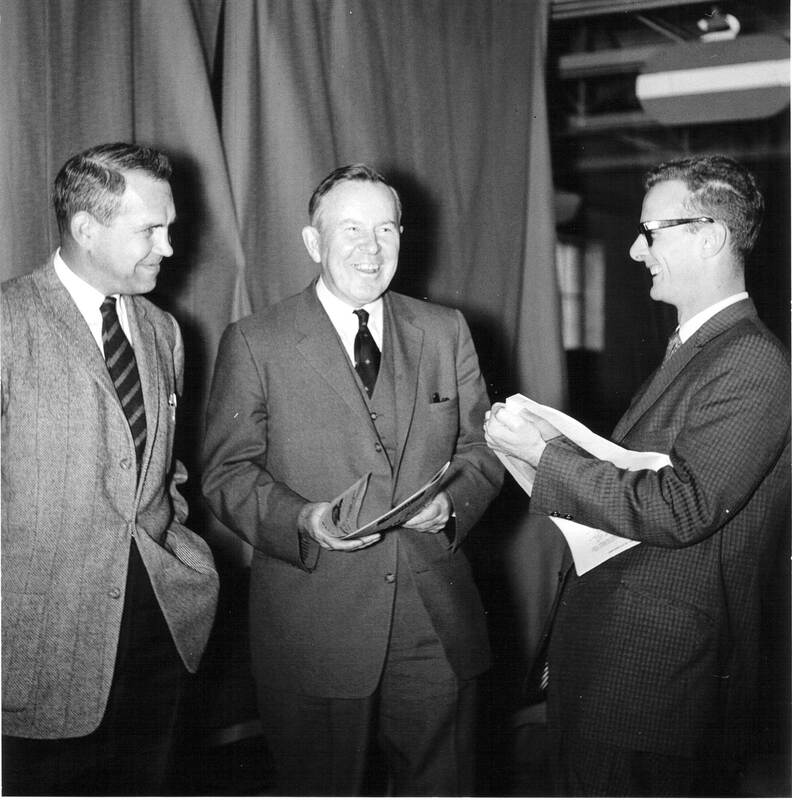 Brissenden joined the Noranda group in 1948 as a mine superintendent and was soon noticed for his ability to grasp and evaluate information and recommend action. His first challenge came at Gaspé Copper, which was then wrestling with how to mine its huge, low-grade underground deposits at a profit. After intensive study, a room-and-pillar method was chosen as the method best suited for the tabular, gently dipping orebodies. Brissenden was the chief architect of the method, which proved so successful that engineers came from around the world to study the operation. The mine operated for 44 years, providing much-needed employment and benefits to the Quebec economy. At Brunswick, he introduced a mechanized cut-and-fill mining system that allowed production to be increased to 7,500 tonnes per day from 4,500 tonnes. He also converted the Imperial smelting furnace at Belledune to a lead smelter, and implemented environmental improvements at all metallurgical plants. In the early 1970s, researchers developed a unique concept for continuously smelting copper concentrates. Brissenden supported their efforts and convinced Noranda’s Board to invest in a full-scale prototype at the Horne smelter. The technology proved to be remarkably well-suited to the profitable treating of complex and varied custom materials. 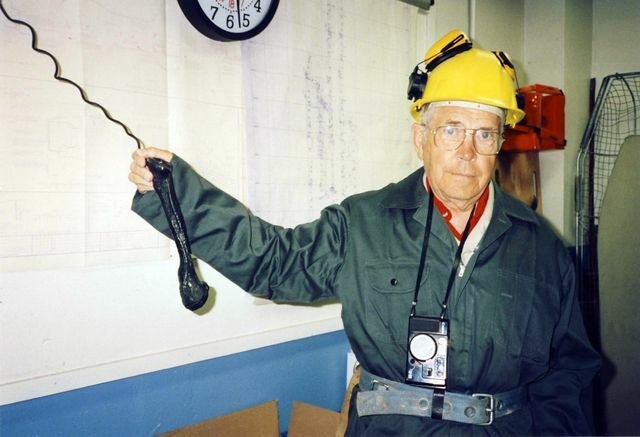 Thus, Brissenden helped prevent the loss of about 2,000 jobs when, in 1976, the Horne mine finally stopped hoisting ore.
Brissenden went on to enjoy a successful career as a mining executive, entrepreneur and consulting engineer with the Patino organization and its affiliated companies. His service to the industry resulted in interactions with many political leaders (with whose politics he did not necessarily agree but with whom he would still have acted the gentleman! 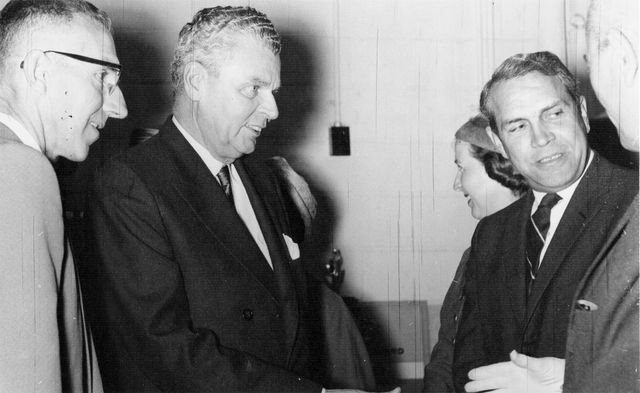 ), including René Lévesque, Pierre Elliott Trudeau, Lester B. Pearson, John Diefenbaker, and Kim Campbell. 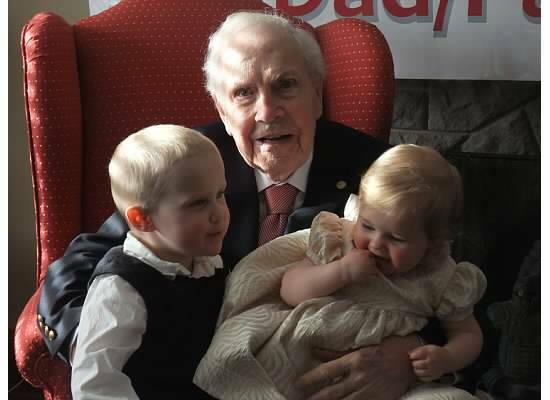 For his 90th birthday, he received a letter from the Prime Minister, Paul Martin. 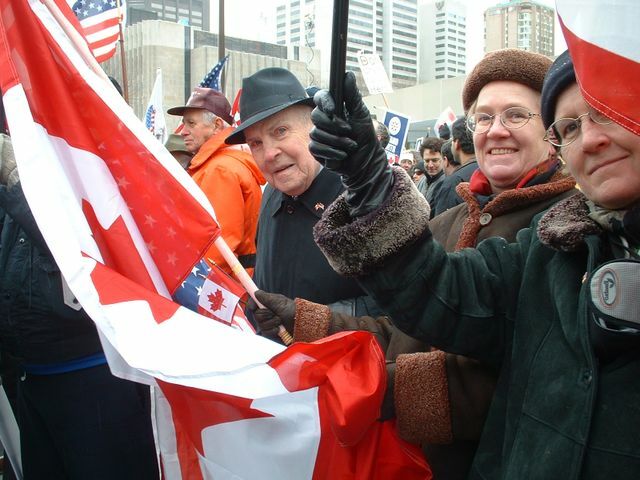 He was of course sorely disappointed with having to settle for a letter from a Liberal, and his strongly held Conservative leaning led him to attend his first political rally at around the age of 90, joining other Canadians in support of George W. Bush (I certainly admired his devotion to a cause). Papa and his daughters Jane and Janet at the “Canadians for Bush” rally. 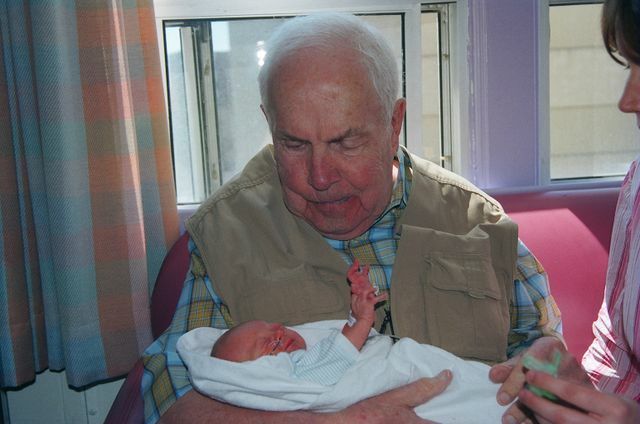 Papa meeting baby Ben for the first time. He had a soft spot in his heart for Ian, which Ian attributes to their first meeting, when Papa fixed him with his trademark flinty stare and said, “Now why on earth would you do an ARTS degree?” and Ian took a sip of his water, met his eye, and said, “Well sir, the way I see it, any idiot can be an engineer. It takes brains to go into Arts.” What could Papa do but clap him on the shoulder and burst out laughing? Finally, as we approach Remembrance Day, and as we bid farewell to yet another veteran of the Second World War, it is especially important to note Papa’s devotion to Queen and country and service in the Royal Canadian Navy, and I can think of no better way to describe his service than in his own words in a speech delivered to my cousin’s high school a few years ago. 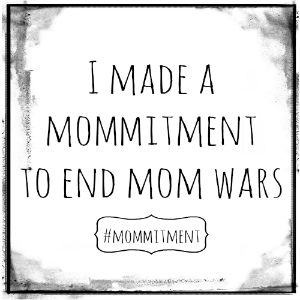 As Ben put it, “Mommy, our family is just not going to be the same without Papa, is it?” and no, it isn’t, but he has been a role model in so many ways to so many people that his legacy will live on, and I’m glad that he has moved peacefully onto the next stage of his journey. Nana looking as polished as ever!